Product Consist: Bouquet of 5 Yellow Roses with 5 Bar of Cadbury Dairy Milk Chocolate (Weight: 12 Gm each) tissue paper very nicely wrapped with bow tie on it. Chocolate and Roses can be an expression of your feelings and simply a delicious treat to say you are thinking of someone special. 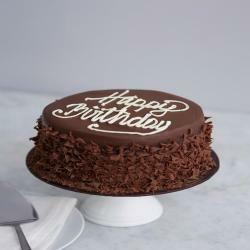 Cadbury Dairy Milk Chocolates and Red Roses arrangement are an ancient way to celebrate Birthday, Anniversaries, Valentines and many more. 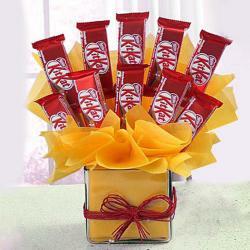 These Red Roses and Chocolate are prepared to use the premium quality of ingredients to ensure the freshness. 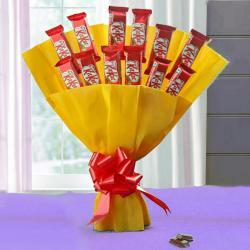 Cadbury Dairy Milk Chocolate and Red Roses arrangement is one of the finest and most loved, relished on every occasion and even without occasion. 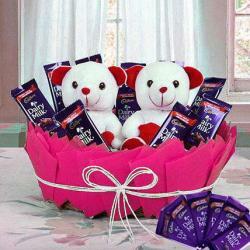 Gift this mind blowing hamper to your loved ones on special occasions. 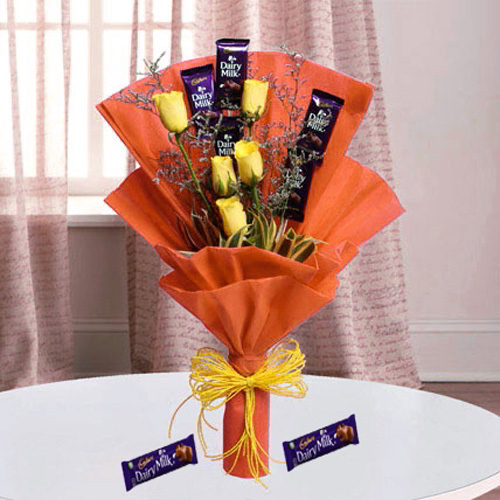 Product Includes: Bouquet of 5 Yellow Roses with 5 Bar of Cadbury Dairy Milk Chocolate (Weight: 12 Gm each) tissue paper very nicely wrapped with bow tie on it.